Around 30 participants gathered in the Nordic Open Geodata Meetup at the Norwegian mapping authority Kartverket’s headquarters in Hønefoss, Norway. The participants convened from around the Nordics: Norway, Sweden, Finland and Estonia. One reason for the gathering was to chart ways of networking about open geodata in the Nordic countries. Another aspect was to discuss ideas for the #Hack4NO hackathon that followed the next day. New networks were not set up during the days but the ideas are maturing. In Finland, mappers are finding ways to get organized, and the Wikimaps project is setting up a Wikimaps user group. This is intended to be an evolving blog post as people are sending in their documentation and thoughts. Check back later as well! Erno Mäkinen presented Humanitarian OpenStreetMap Team tools and activities, focusing on the recent growth of especially the humanitarian mapping events in Finland. Mapping events are great at bringing people together, in particular when the action has direct impact. The tools for humanitarian projects are same as for other kinds of mapping. Albin Larsson presented the new mapping possibilites in MediaWiki projects with the Kartographer extension’s <maplink> and <mapframe> tags, and using SPARQL queries in Wikidata and geographic shapes from OSM to create maps. Vahur Puik presented the gamified environment Ajapaik for crowdsourcing locations for old photographs, and the forthcoming Norwegian instance Fotodugnad. Susanna Ånäs proposed new configurations for cultural projects, combining humanitarian work with existing GLAM-Wiki activities in Wikimedia. Esa Tiainen presented Georef – a new Finnish initiative to organise Finnish place names – both current and historical – as linked data. Susanna Ånäs also briefly showed WikiProject Historical Place, which is a project to model historical places in Wikidata. We need authorities, researchers and volunteers working together to bring knowledge about historical places into Wikidata! 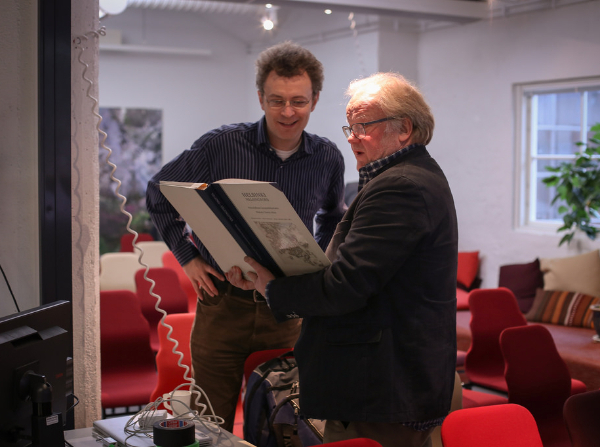 Bjørn Ivar Berg presented the case of the Norwegian Mining Museum’s rich archival content. Vemund Olstad presented the K-Lab map demonstrators and how they have been used in the project En Blå Tråd. Marianne Wiig presented Lokalhistoriewiki, a wiki that includes rich information about people and places in Norway. 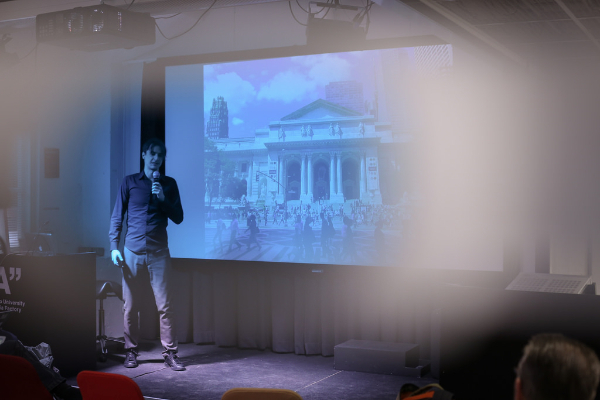 Peter Neubauer presented Mapillary, the crowdsourced street view and their new plans to offer the users of Panoramio the opportunity to migrate their images to Mapillary. 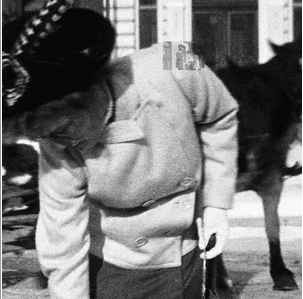 Mapillary connects with OpenStreetMap, and there have been ideas to connect historical images through Mapillary in the same way. Lasse Sætre briefly described his work with mapping community Maptime Oslo. 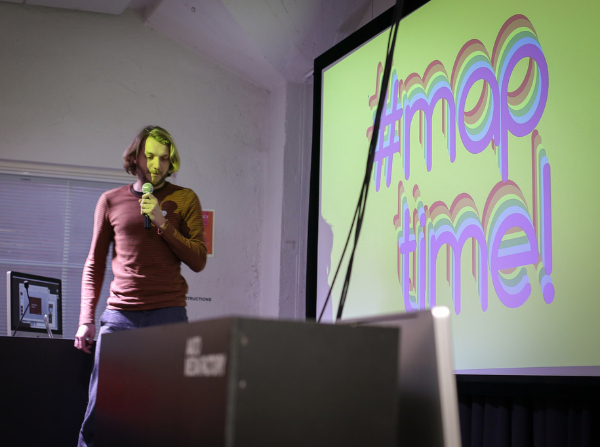 Maptime chapters exist in many Nordic cities, and they connect activities between mappers, designers, open data enthusiasts etc. Susanna Ånäs proposed a user group for mapping related activities in Wikimedia. A user group is not an organization, but it would be recognized as a Wikimedia affiliate. It could give visibility and emphasis to mapping activities, and help channel the discussions about development issues or community needs. Would you have interest in the group? Do you think you could benefit from it? Would you be interested in being a founding member? This entry was posted in Documentation on 5 November 2016 by Susanna Ånäs. 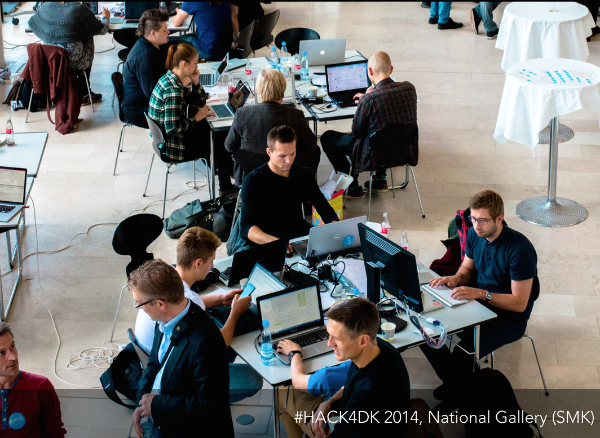 The Nordic open geodata gathering will be arranged in the context of #Hack4NO in Hønefoss, Norway, on 27 October. Come with us to cross bridges between countries, communities and practices in open geodata! The program will touch working with historical maps, locations and photographs, humanitarian mapping and the new Wikimedia mapping technologies that make use of Wikidata and OpenStreetMap. You are also welcome to present your projects and collaboration ideas! Present or propose collaboration or a hack! If you are interested in presenting in the program, please contact the organizers. You may jot down your suggestion in this pad. This will also become the documentation of the event. Building networks for continued collaboration, projects and hacks. Find your soulmates! 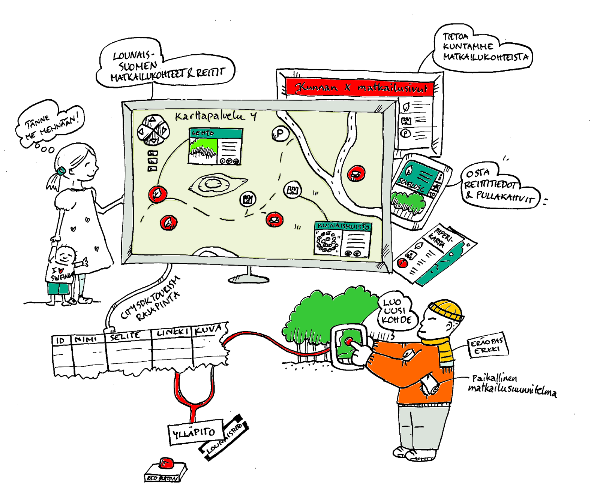 The various volunteered geographic information communities in the Nordic countries have nothing but to benefit from each other. 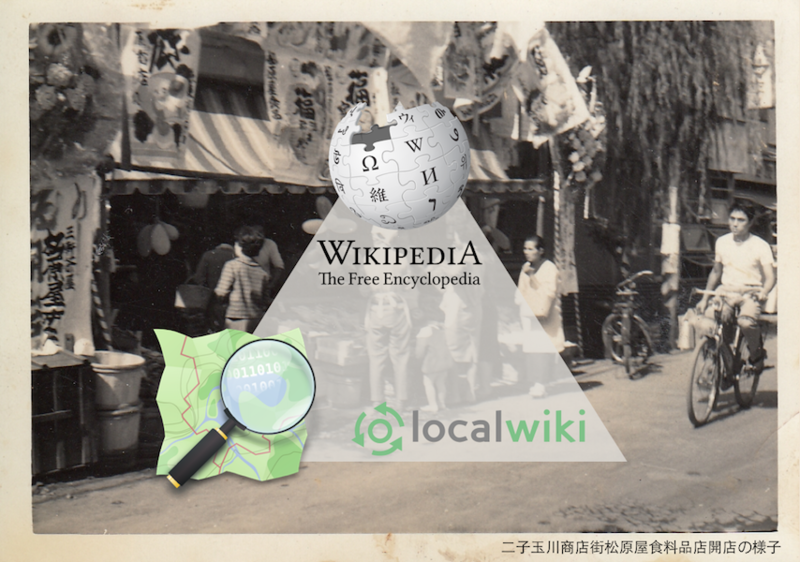 Geolocation – also in the historical context – is becoming an essential part of the knowledge preserved in Wikimedia projects. Humanitarian mapping is more actual than ever, affected communities are everywhere, nearby, making it easy to step into action. Governmental open geodata is more advanced in the Nordic countries than anywhere in the world. We can make something unique with what we collectively can. The meetup day hosts lightning talks to get to know what’s happening in the Nordic open geodata community and hands-on workshops to familiarize with tools and technologies. In the open part you can show your work and give a talk, or we can set up collaborations for the weekend or further on. We’ll end the day by discussing ways of working together. #hack4no has also excellent data journalism mapping lectures and workshops running parallel with the meetup. You are welcome to mix between the Nordic open geodata meetup and the data journalism sessions freely. This entry was posted in Call for participation, Wikimaps Nordic on 14 October 2016 by Susanna Ånäs. 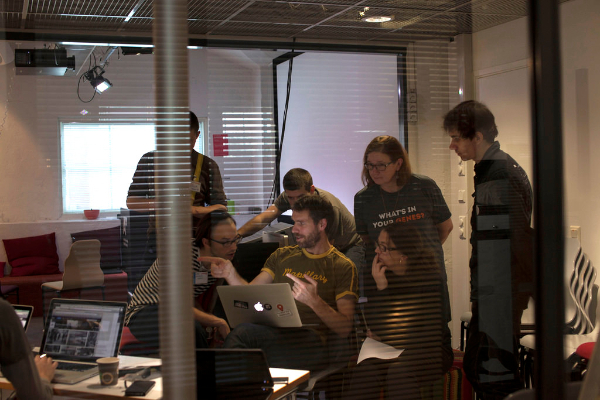 The Digital Humanities hackathon was arranged by University of Helsinki & Aalto University for the second time 16–20 May 2016. The educational event aimed to bring together students and researchers of humanities, social sciences and computer science, for a week of active co-operation in groups under the heading of Digital Humanities. 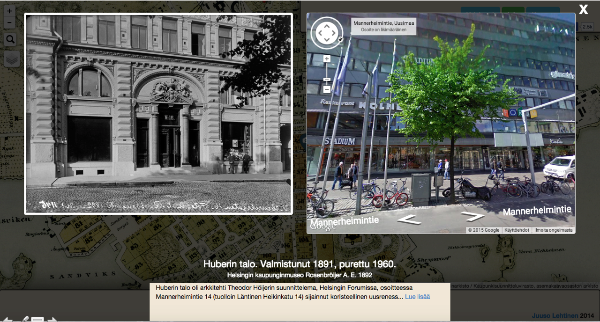 I joined the group who investigated the temporal change of Helsinki through open data and maps provided by Helsinki Region Infoshare, along with cityscape photography by Helsinki City Museum, served through Finna.fi. My fellow investigators were Jussi Kulonpalo (Univ. 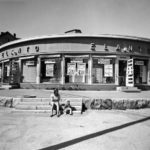 Helsinki, Social Research/Urban Studies), Timo Laine (Univ. Helsinki, Moral and Social Philosophy), Kari Laine (Aalto University, Computer Networks), Antti Härkönen (Univ. Eastern Finland, General History), Kaisa Sarén (Univ. Helsinki, Bioinformatics), Maija Paavolainen (Univ. Helsinki, Library Sciences) & Rauli Laitinen (Aalto University, Built Environment/ Urban Academy). We chose Western Pasila as a neighbourhood we wanted to observe. It is the last wooden village that has been torn down to make way for a completely new housing project. 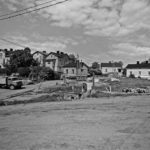 At the time, it was also the last remaining freely built working class neighbourhood, dating back to the turn of the 20th century. The area had been under threat of demolition since the 1940’s, which had led to negligence and deterioration of living conditions. 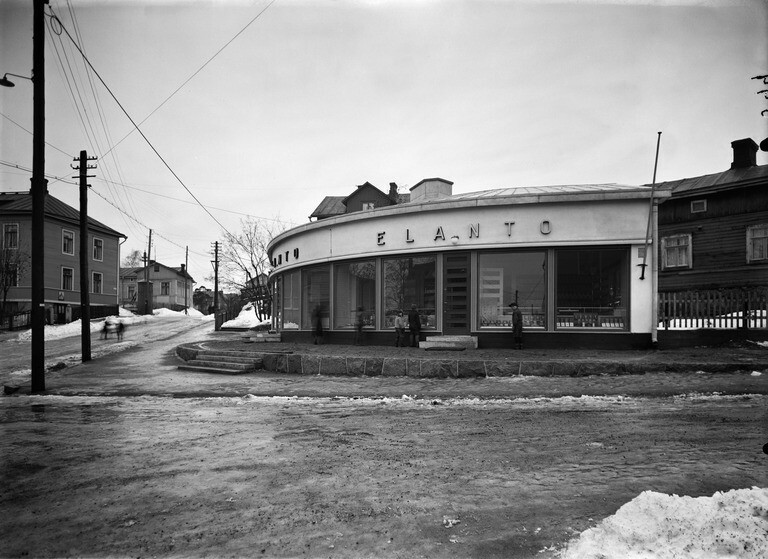 Finna has an impressive collection of openly licensed photographs from the area, taken mainly by photographers of the Helsinki City Museum in a pursuit of documenting the disappearing environment. 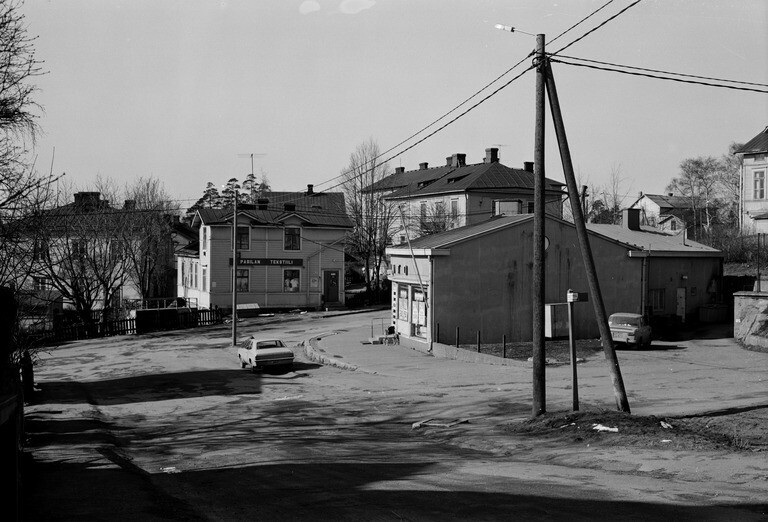 The photographs do not have exact coordinate location in their metadata, and Timo Laine, who also works for Finna, proposed to use the street name tags to find all Pasila images instead. 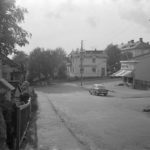 To get a list of the names, we digitized 2 publications of Helsinki historical street names and used the list to query Finna images. Timo came up with a method of evaluating the images by the nature of their keywords. 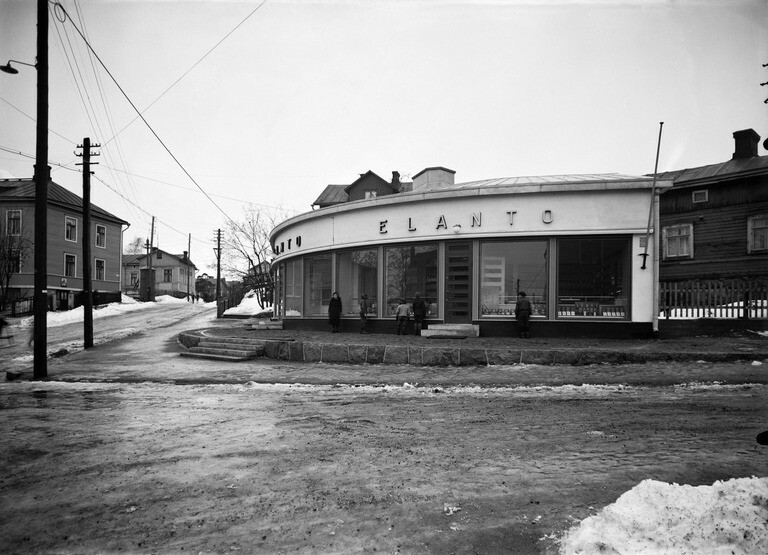 The elements of change were positioned on an axis: old–new, wood–concrete, soft–hard, past–future, freedom–control, community–family unit, Reverend Kantele–Reijo Jallinoja (Reverend Väinö Kantele was a missionary who decided to devote his life to aiding the poor people of Pasila, while Reijo Jallinoja was the architect of the new Western Pasila). Keywords were assigned to one or the other category, and this produced an index number for each image. I started working towards a street view experiment. First we needed to create a map of the area. 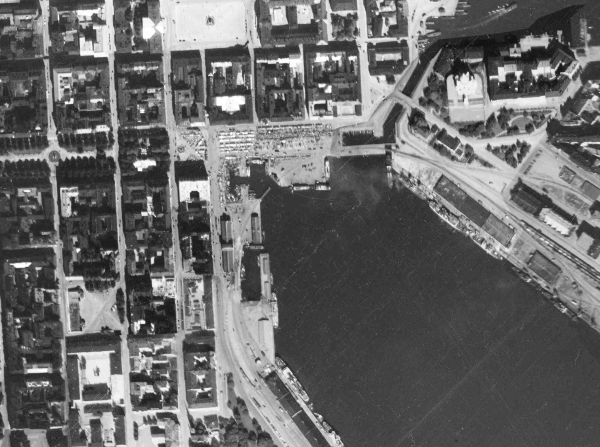 I took a 1969 aerial image from HRI to work with. I used the Wikimaps workflow to do that: I uploaded it to Wikimedia Commons, added the Map template to it and used Wikimaps Warper to georeference it. I was lucky enough to find a few houses that remained from before the development for compositing the then and now images. The file exists also as a readily georeferenced GeoTIFF. OpenHistoricalMap is the perfect tool and environment for historical mapping, even though the project is not yet stable. It has all the same tools as OpenStreetMap for creating a map. Features are tagged with start and end dates and that will allow setting and displaying map features on a timeline (in the future). Turning the map data in OpenHistoricalMap into something that other environments can use is difficult. After trying out many unsupported, broken and obsolete workflows, I found a working solution. For exporting the data using the OpenStreetMap desktop editor JOSM works nicely. Albin Larsson has written a useful blog post to encompass in making the right settings. OHM’s own export is currently dysfunctional. For converting the .osm file format into GeoJSON or KML, it’s possible to use Overpass Turbo for OpenHistoricalMap. It requires learning the query language. Historical street view vistas should be easy and painless to create for volunteer contributors. I keep looking for a workflow that is open, easy, collaborative and productive. 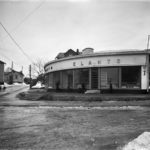 I took a test set of 12 images of the same building from different angles over a few years period. Elannon Pasilan myymälä. Hertankatu 15. 28. -29. 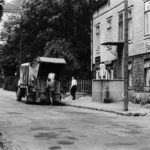 8 1971 välisenä yönä myymälä muutettu palvelusmyymälästä pikamyymäläksi. Elannon uusi Pasilan liiketalo, jossa oli sekatavara- ja leipämyymälä. Hertankatu 15. 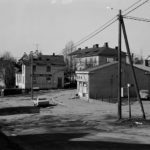 Kiviset portin pylväät, vasemmalla Elannon myymälärakennus Hertankatu 15:ssä sekä oikealla Eevankadun puutaloja Länsi-Pasilassa. 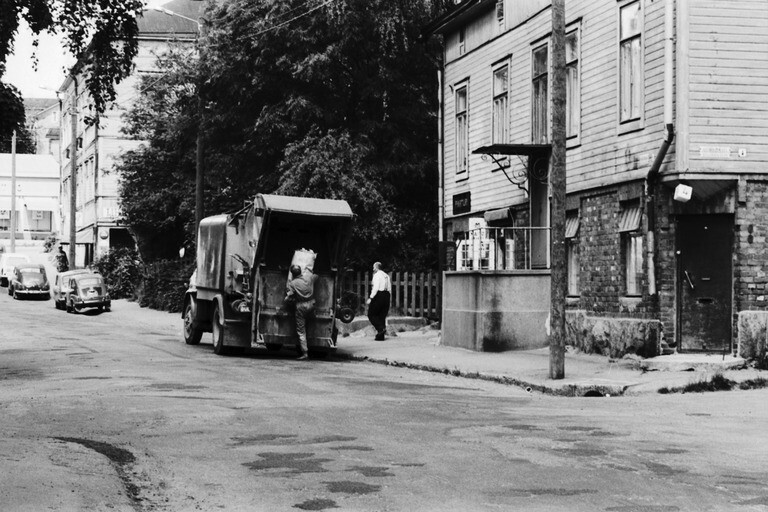 Kesä 1974. Kuvattu Susannankadulta käsin. Elannon uusi Pasilan liiketalo, jossa oli sekatavara- ja leipämyymälä. Hertankatu 15 (= Pasilan puistotie, Hertanmäki). Kuvattu mahd. Susannankadulta. Eevankatu. Puutaloja Eevankadulla Länsi-Pasilassa. Vasemmalla Elannon takapihaa. Hertankatu 9. 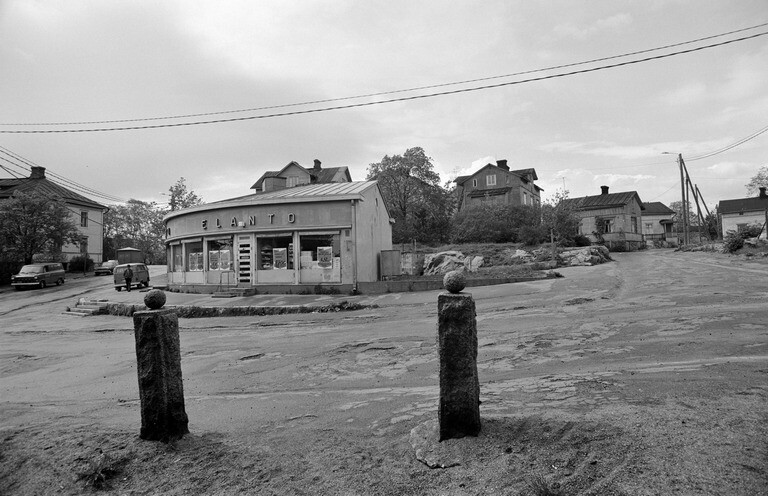 Kyllikinkatu 4. Näkymä Kyllikinkadun kulmasta Hertankadulle. Jätehuoltoauto Hertankatu 9:n puutalon edustalla, jonka kivijalassa parturi ja Maanviljelijäin Maitokeskuksen myymälä. Kadun päässä Elannon liikerakennus. Elannon uusi Pasilan liiketalo, jossa oli sekatavara- ja leipämyymälä. Hertankatu 15 (= Pasilan puistotie, Hertanmäki). 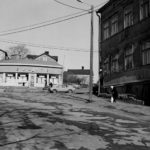 Oikealla Hertankatu 13, jossa 1970 lopettanut jalkinekorjaamo. Ajapaik project would be my option for crowdsourcing the locations and directions of the images. This time there was no time for a collaborative effort, so I followed a workflow that was tested in Maptime Copenhagen together with Mapillary. Geosetter is a great application (Windows only) for setting the location and heading of images, and writing the data in the EXIF metadata section of the image. It does not seem possible to load a historical map layer into Geosetter, which would be not only useful but essential in order to geolocate historical images. The advantage of Google Earth is the display of 3D terrain and buildings. I planned to import the converted historical map into SketchUp and define height to the buildings, but I was not able to convert the file to a format SketchUp would understand. It would be possible to use Google Earth to overlay the image onto a 3D view and be able to place it correctly. This workflow should be ported to an open platform. After the files were prepared with proper EXIF data, they were ready to be imported into Mapillary. In this test I stopped here. 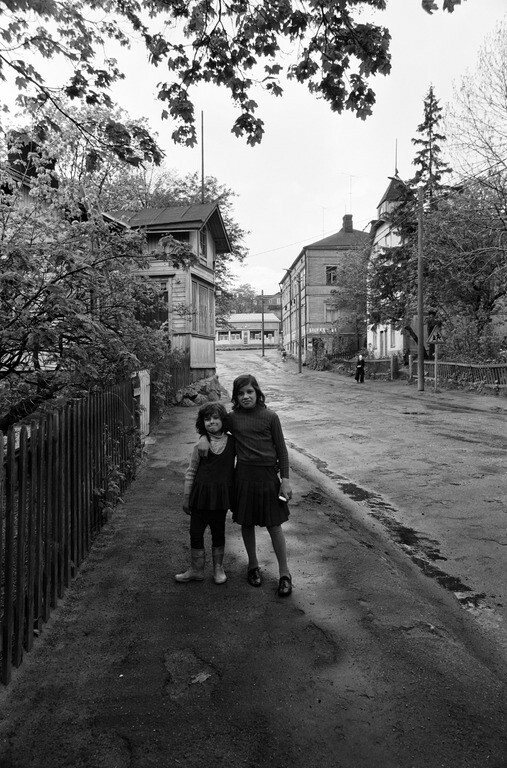 The series of images did not yet resemble a street view experience. There are controls I can use to tie the images correctly together. MapillaryJS is available for further tinkering. I will look into them for the next blog post. The street view experiments can continue in workshops during the summer. There will be one in Wikimania in Esino Lario, Italy 22–26 June and another one in the Second Swiss Cultural Hackathon in Basel 1–2 July. I will also bring this workflow into discussion in the Beyond the Basics: What Next for Crowdsourcing workshop in the DH2016 conference in Krakow 11–16 July. Apologies for our group for not presenting all our findings! The presentation will give more insight into that. Thank you for inspiring collaboration during the week! Thank you for the organizers and participants in other groups for an intensive and energetic week with Digital Humanities hacking! This entry was posted in Showcase on 25 May 2016 by Susanna Ånäs. Tim Waters, Susanna Ånäs, Albin Larsson and Ari Häyrinen received an IEG (Individual Engagement Grant) from the Wikimedia Foundation to work on a renewed Warper for the Wikimaps project. We have observed that if the Warper experience was easier and more pleasant, we would attract more volunteers in warping old maps. In order to let some developers work on the program features and others on the user interface, we would need to separate program components, decouple them. The program could serve any external application through the API. The Warper’s own user interface would be one of the program’s clients, and the Warper program would be dogfooding the Warper interface. We also have neat new features that we had already started to work on. Stay tuned for specific blog posts about them! Importing a Commons category of maps to the Warper. We are focusing only on the program features in this project, but we are guided by the envisioned design of the tool. Have a look and comment the evolving mockup doc. What we put in, who we address, what comes out in short, medium and long range. Do you agree? Have a look and comment! We will arrange focused meetings with advisors regarding specific aspects of the development, and make documentation about the meetings available. Additionally, there will be a public Hangout session open for everyone. If you wish to participate, enroll as volunteer or leave a note on the project page. Tim Waters – back end. Tim is the original developer of the MapWarper software. It was originally created for the New York Public Library, where it serves thousands of openly available maps. The open source code has spawned MapWarpers around the globe. Albin Larsson – front end. Albin has worked on the iD editor for OpenHistoricalMap, a sister project for the Wikimaps project. He has made a proposal for a linked data approach to OpenHistoricalMap data and created a prototype of modeling historical buildings in 3D. Ari Häyrinen – integrations. Ari is developing a metadata enhancement tool to be used with GLAM mass uploads in a Wikimedia Finland project. The project will link between copies of files in different repositories to take advantage of spatial mapping possibilities offered by some of them. 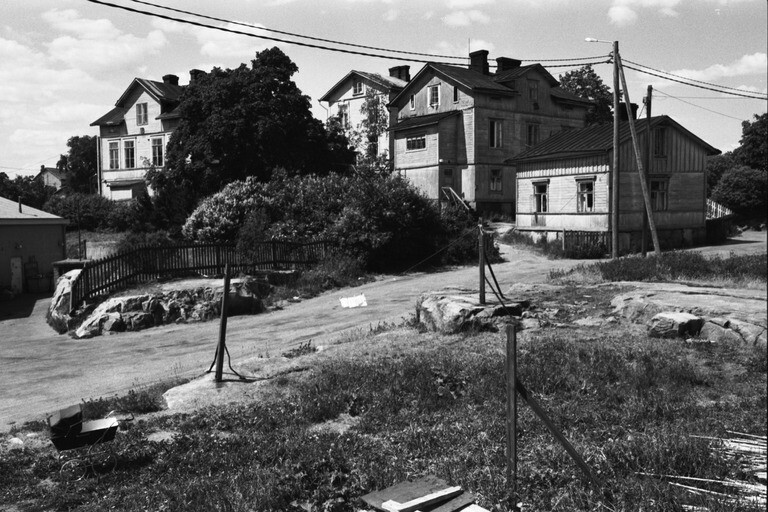 Susanna Ånäs – coordination, design. Susanna has run the Wikimaps project and network over a two-year period. She will contribute to the design aspects, but mainly her task is to facilitate communication and participation in the project. This entry was posted in Uncategorized on 8 February 2016 by Susanna Ånäs. The latest historical map to Wikimedia Commons, Nova et aucta orbis terrae descriptio ad usum navigantium emendate accomodata by Gerhard Mercator, has been uploaded today. There are now 15 620 maps with the Map template in Wikimedia Commons! Wikimaps Nordic project has now officially been completed. 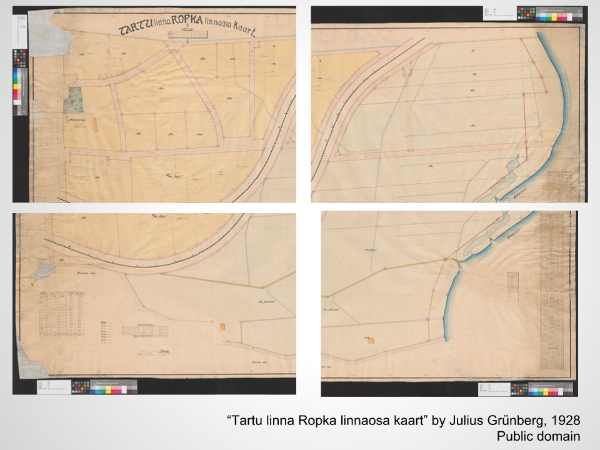 Nordic Culture Fund and Wikimedia Foundation have supported bringing mapping tools for historical maps to Wikimedia Commons, and creating maps activities especially in the Nordic countries. We welcome you to view the project report and to comment and propose new directions! The work continues with the Wikimaps Warper 2.0 project, funded by the Wikimedia Foundation. There are many more directions to follow, and here are short teasers for some of the ideas. What do you think? Comment here, in the Facebook group, or in the Commons project page. We would like to invite all wikidatans and linked data buffs to discuss how data about historical places should be modelled in Wikidata. Facilitating uploading maps to Wikimedia Commons, linking maps and historical data about places, using the maps and data in Wikimedia projects and working together with OpenHistoricalMap to store the world map of history. We wish we can work to bring more tools together to help finding and interpreting open historical documents. With the help of the tools it should be possible to enrich Wikimedia content, but also make original research that could be used in further research, hacks, apps, stories and more. 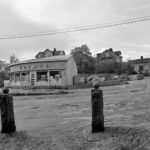 Imagine finding an old picture of a place or people and unfolding the story behind it with the help of thousands of volunteers interested in the same things. Imagine you could continue gathering context to the story with the help of maps, images and documents from museums and archives as well as pictures and letters in your own albums and shoeboxes. Let’s work together on making it possible in the open environments! “Finnmarkens amt nr 13- Wardøehuus Festning udi Grundritz, 1793“. 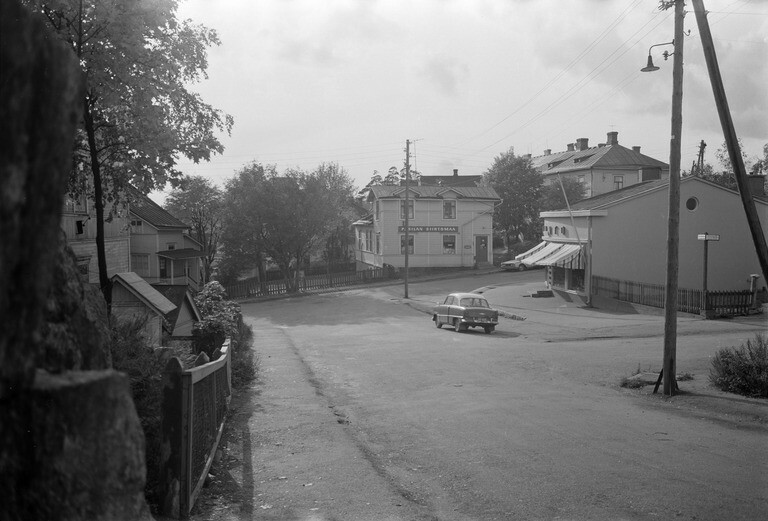 – This file is digitized and shared in Wikimedia Commons by Kartverket. Licensed under CC BY 4.0 via Wikimedia Commons. This entry was posted in Wikimaps Nordic on 20 December 2015 by Susanna Ånäs. “Kidron Monuments 1868” by Alexander von Wartensleben-Schwirsen – National Library of Israel, Eran Laor Cartographic Collection. Licensed under CC BY 3.0 via Wikimedia Commons. The National Library of Israel has released a collection of 200 high-resolution unique maps of Jerusalem in collaboration with Wikimedia Israel. This collection of ancient maps, spanning from 1486 to 1947, contains a variety of styles and languages. To celebrate this, Wikimedia Israel will hold an editathon / mapathon in the National Library. It will be a social event to create, update, and improve Wikipedia articles about maps, cartographers, and locations. The editathon will take place on December 15th and will include a guided tour in the rare map collection of the National Library. Wikimedia Israel encourages the Wikimaps community to use the maps in Wikimedia initiatives and other open source projects and wishes for a wonderful Holiday Season and a Happy New Year! “Ierusalem, et suburbia eius, sicut tempore Christi floruit…descripta per Christianum Adrichom Delphum ^-cartographic material” by [National Library of Israel http://nli.org.il]. Licensed under CC BY-SA 3.0 via Wikimedia Commons. “Civitas Iherusalem” by The National Library of Israel – The Eran Laor Cartographic Collection, National Library of Israel. Licensed under Public Domain via Wikimedia Commons. “Jerusalem-1907” by The National Library of Israel – The Eran Laor Cartographic Collection, National Library of Israel. Licensed under Public Domain via Wikimedia Commons. This entry was posted in Promotion on 15 December 2015 by Susanna Ånäs. DroneArt Helsinki! 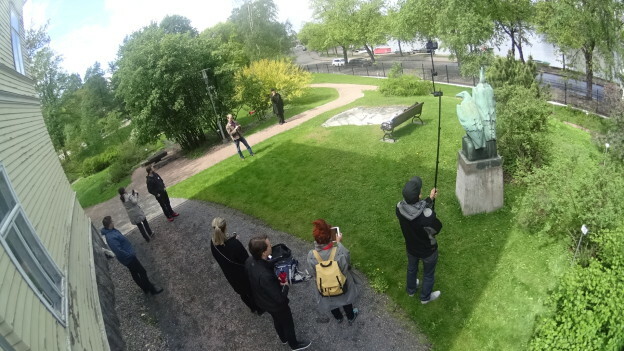 was an event organized in collaboration with Wikimedia Finland, Maptime Helsinki and AvoinGLAM, where we experimented with bringing public artworks and statues into the open through Wikimedia sites. At the same time Wikimedia Sweden’s Jan Ainali, John Andersson and André Costa were visiting us. The aim was to phtograph statues with drones, place them on a map and model in 3D. We put together a great program of presenting public art in Wikimedia. Heikki Kastemaa opened the event by describing writing about public art in Wikipedia. According to him, there is no established method for it, but often articles about public art contain some or all of the following: description of the artwork, the provenance and reception. Images of the artworks are intended to communicate information about the works. John Andersson told about the Wiki Loves Public Art project that was initiated by Wikimedia Sweden. Thanks to the project, our colleagues in Sweden have been able to gather a public art database covering the whole country. André Costa was presenting productions that were created around the project. The database has been turned into the Offentligkonst.se map service. In another project images from Wiki Loves Monuments and Mapillary have been brought together. Finland and Sweden have basically similar copyright legislation based on the pan-European practice. A work of art is protected with copyright 70 years from the death of the artist. Replication of the work, images or 3D models are not allowed to be distributed freely. Works placed permanently in the public space are an exception, but this exception is dealt with slight differences in different EU countries. The exception is called the Freedom of Panorama. 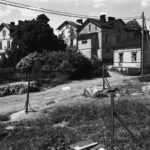 In Finland all artworks placed permanently in public space or in it’s vicinity are allowed to be photographed freely, but the images must not be used commercially. In addition, the images stored in Wikimedia must comply to the copyright legislation in the originating country and the United States. Because of this even more images fall outside Wikimedia Commons. In the Finnish Wikipedia images are stored locally and they can be used according to Finnish copyright law based on the right to quote, in the respective article of the artwork. Represenatives of the Wikimedia movement strive to affect the current changes in copyright legislation in Brussels, and one of the most important reforms is the unification of freedom of panorama. Local representatives are welcome for this work. We wanted to try out many different ways to photograph the statues to create the 3D models. The statues is photographed from all sides with many images. A drone or a long monopog helps in reaching the heights. All corners of the statue must be explored with different shooting angles. The weather forecast promised stormy wind and rain. There were clouds in the sky. The drone was tossed around by the wind, but finally we went happily back to our workshop with plenty of images. As a result of working with different Structure from Motion programs, we were happy to note that the stormy clouds were not the only clouds: we managed to create a point cloud! 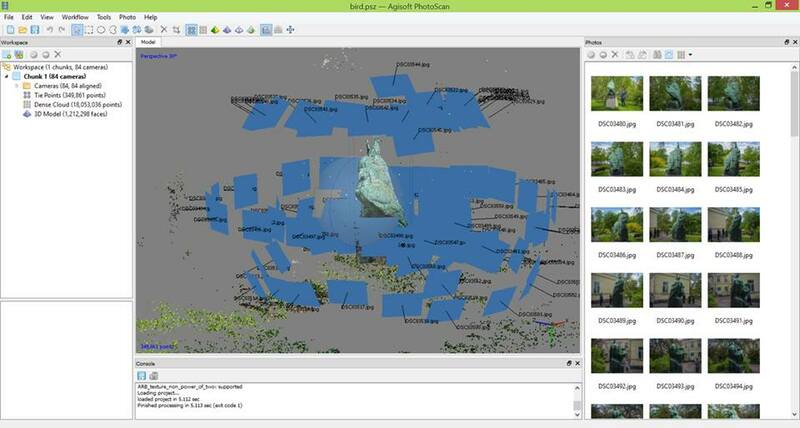 A point cloud is a computer generated 3D model that consists of points situated in 3D space. Comparing different images taken from different angles, matching points can be found and they are mapped into 3D space quite as mystically as surveyors reveal distances. The point cloud was further elaborated into a polygon mesh, out of which a 3D printer was able to create an object. We shall attach the image here as soon as we get it. The copyright of the work has expired. The artist is Bertel Nilsson, and the work is Eagles, made in 1913. This entry was posted in Promotion on 6 June 2015 by Susanna Ånäs. 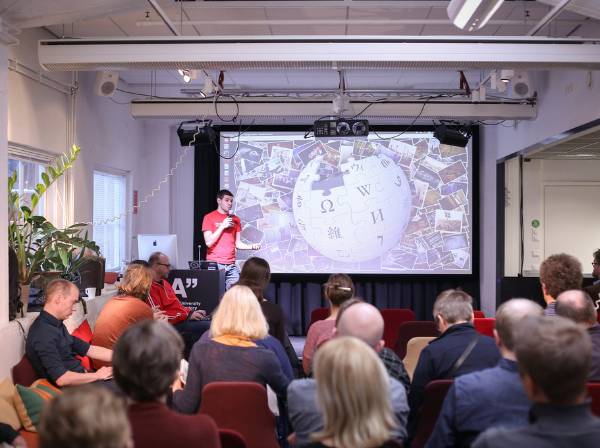 Wiki Loves Maps seminar (February 5, 2015) and hackathon (February 6–8, 2015) were arranged in Helsinki. The altogether 4 days brought together a full house on all the days. Wiki Loves seminar was organized by Wikimedia Suomi in collaboration with the city of Helsinki. 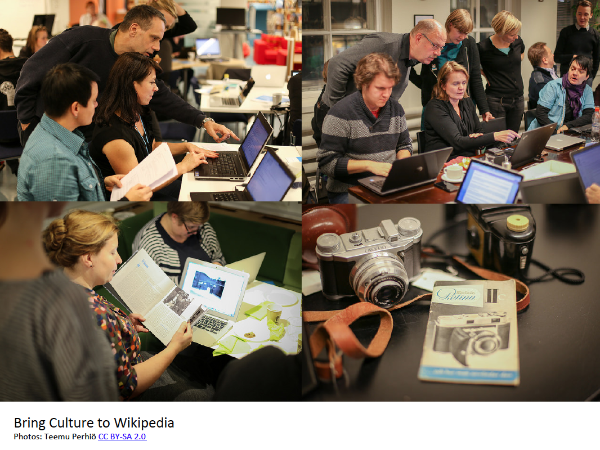 Wiki Loves Maps hackathon was part of #Hack4FI – Hack Your Heritage event. Thanks to our team Teemu, Samppa and Ari, and thanks to the #Hack4FI team Sanna, Laura and Neea, as well as Anna, Arttu and Juhani from Media Factory! And all of you who participated onsite or online! The seminar video stream is available for viewing. 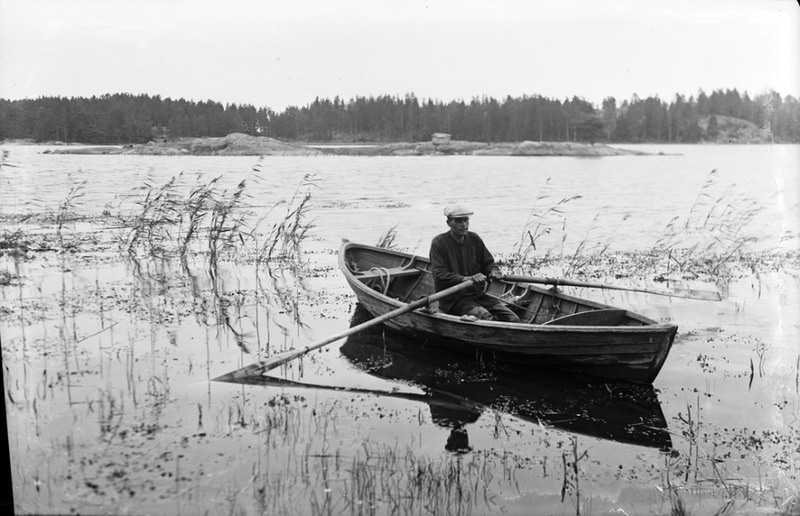 In Flickr there are photographs by Teemu Perhiö / Wikimedia Finland licensed under CC BY-SA 2.0 and Hack4FI photographs by AvoinGLAM licensed with CC NC-BY-SA. The seminar presentations are shared in a Drive folder. The #Hack4FI project folder is in Drive. Wikimaps has a Facebook group. There is now also a new Facebook group for #Hack4FI, where you can connect with others who took part. The Documentation page in the Wiki Loves Maps site will be updated with new posts. We appreciate if you fill in the survey. It’ll help justify further events in the future! If you can’t find the email, use this link! Thank you! 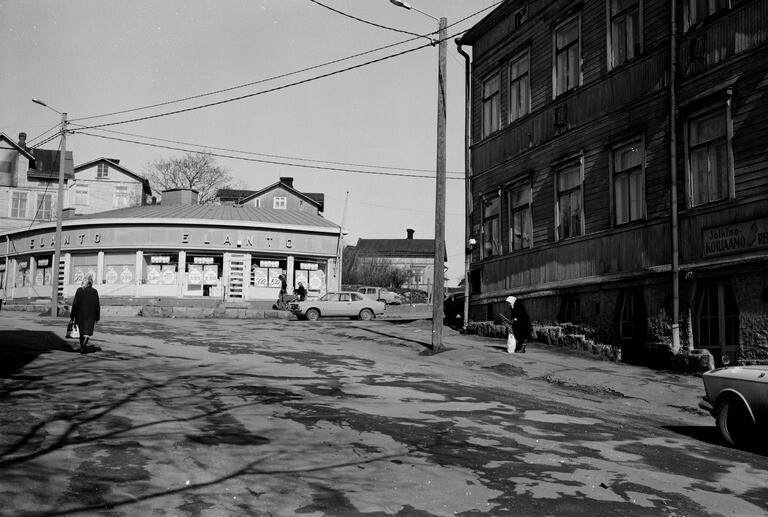 The theme of Wiki Loves Maps was Historical Aleksanterinkatu. 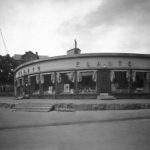 It’s a joint initiative with the City of Helsinki to gather historical materials about the city, combine and reuse them. Arend Oudman gave a bird’s eye view to the city through the series of Historical aerial images from the Metropolitan area he has gathered, prepared and opened. 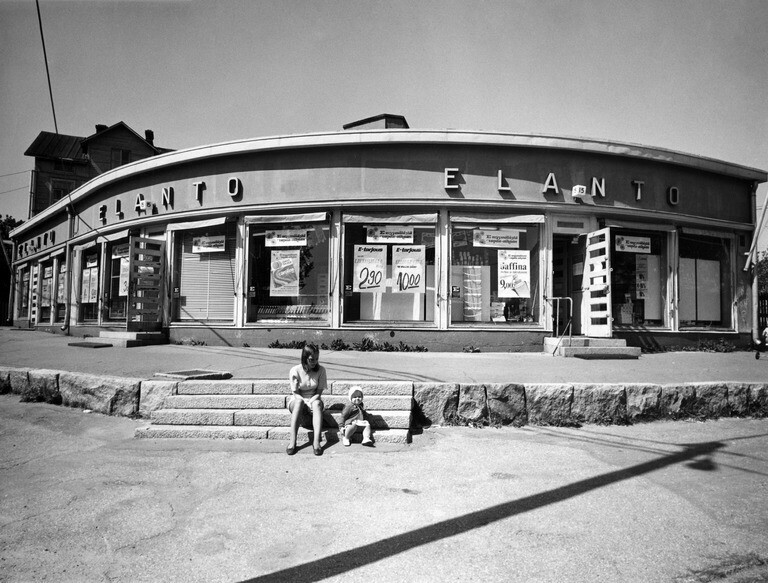 Martti Helminen from the City Archives is the originator of the Aleksanterinkatu theme. 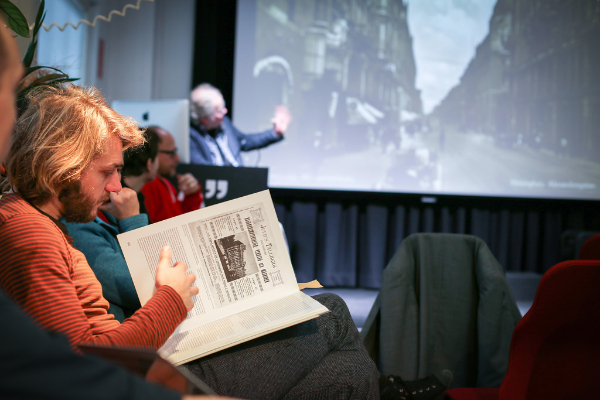 He took us through the history of the street with images, maps and drawings. 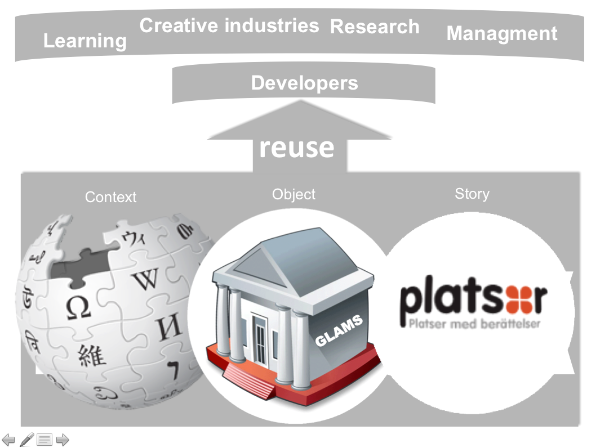 Collaboration projects in the Nordic countries between GLAM organizations and Wikimedia chapters. Encoding and experiencing location in apps. Peter presented Mapillary, a crowdsourced street view environment. But more than that, he pointed out the necessity of open source and content, and the need to create together. He also came up with the term open past! Here are the 4 principles: 1: Start with a prototype. 2: Polish takes time. 3: Everything takes longer than anticipated. 4: Hackathons are starting points. The first ever #Hack4FI carries on the torch of #Hack4DK and #Hack4NO. We collected a set of speakers to present different approaches to working with local and personal history. These materials have fallen outside publicly funded GLAM endeavours, they are not suited for Wikimedia for their lack of notability and they largely live in commercial services. 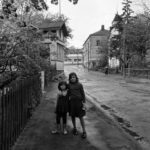 Kimmo Lehtonen, Albumit Auki!, Lasipalatsin Mediakeskus A project that collects family photographs from old albums. Screenshots, API documentation for #Hack4FI. Bert Spaan presented the international learning network Maptime. The idea is to bring together people to learn web mapping tools together. Join MaptimeHEL and prepare for the first meeting!Bert also presented briefly the Dutch historical geocoder project Erfgoed & Locatie. 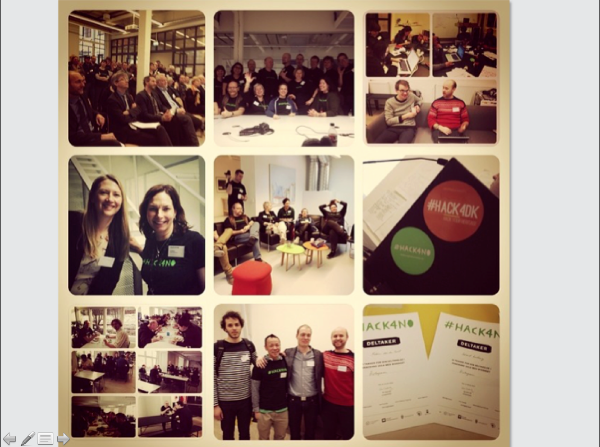 The hackathon, the first of a kind in Finland, was a tour de force of AvoinGLAM. After the weekend participants have six weeks to finalise their works. 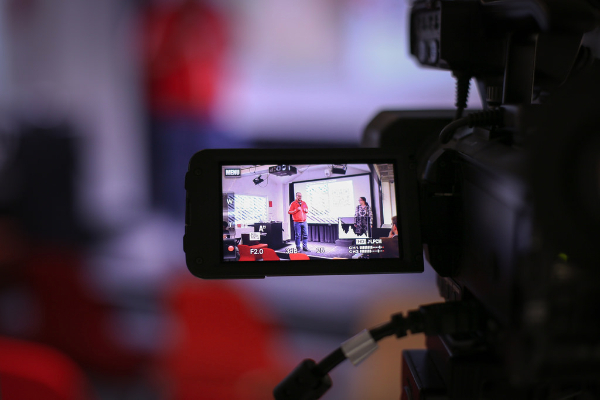 The hackathon ends 26 March with a gala, where the final works will be presented and awarded. Wiki Loves Maps projects were only a part of hacks done over the weekend, and you can see a full list of ideas here. Have a taste of maps projects, or projects by mappers, that were worked on during the event! We aim to connect two projects: Ajapaik for using people’s help in locating places of old images and Mapillary for seamlessly stitching those images into a street view. 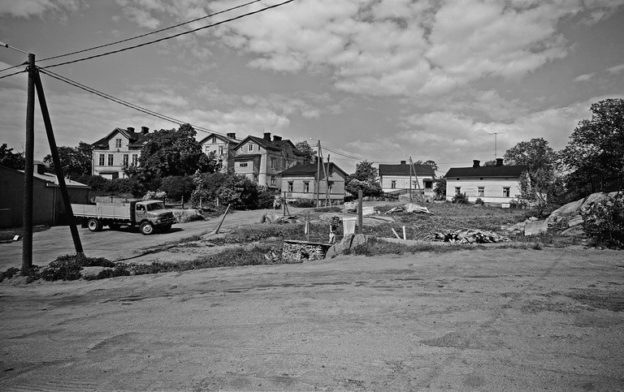 Signe Brander’s Helsinki images are in Ajapaik already and more will follow! The first test transfers from Ajapaik to Mapillary are being made. Wikimedia Sweden has collaborated with Mapillary to create a map for images in the Wiki Loves Monuments competition. Mapillary images can now also be uploaded to Wikimedia Commons and displayed there as a street view. Add this script to your common.js in your Wikimedia Commons settings. The Warper widget to display a warped historical map similarly needs to be created in the next hackathon! 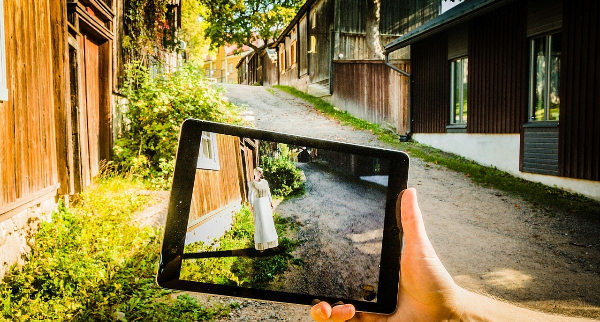 Mauricio Giraldo created this infinite photograph zoom out movie makerinspired by Istvan Banyan’s Zoom that uses photographs from the Finnish poet Edith Södergran. Images are processed in Python with OpenCV to find good transition regions and then animated using Processing. See shapes of buildings and monuments that have Wikipedia articles on a map. Themap background can also be a historical map. By Tuukka Hastrup @tuukkah. You can only store today’s features in OpenStreetMap. This is where OpenHistoricalMap comes in. 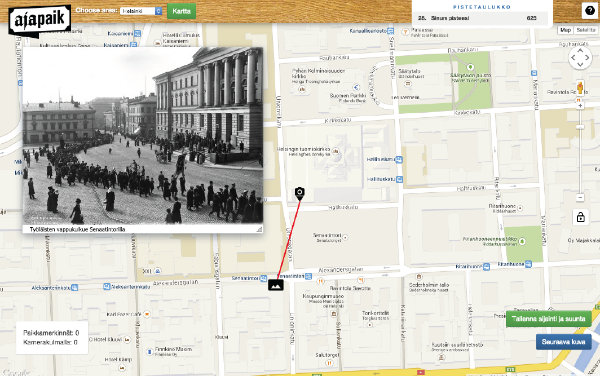 See OpenHistoricalMap at work inside the Wikimaps Warper. The streets have been stripped from the present-day OSM map based on a scanned map of 1900. You can continue the work, adding, deleting and modifying! OHM integration by Tim Waters @tim_waters, streets by SK53 @SK53onOSM. For playing around with georectified historical maps and web maps, see this marvellous tutorial Mauricio Giraldo has created. WikiProject Wiki Loves Maps is a hub for tracking missing and new Wikipedia entries for our topics. Wikipedia articles Kluuvinlahden fossiilit (taideteos) and Aleksanteri II (patsas, Helsinki) were inspired by the Saturday morning walk in the Senate square and Aleksi. By Heikki Kastemaa. The Finnish National Gallery artists database will be imported to Wikidata, and Finnish Wikipedia will be validated manually against that data. By Kimmo Virtanen. André Costa visualized the Swedish Public Art Database with Odyssey.js that makes it easy to create narrated maps. Ecuadorian Paul Villavicencio studies Information Science in Nagoya, Japan. The words Galleries, Libraries, Archives and Museums caught his attention on the Wiki Loves Maps web pages and he decided to travel to the seminar and take part in the hackathon. While studying in Ecuador, Paul worked in the university library. 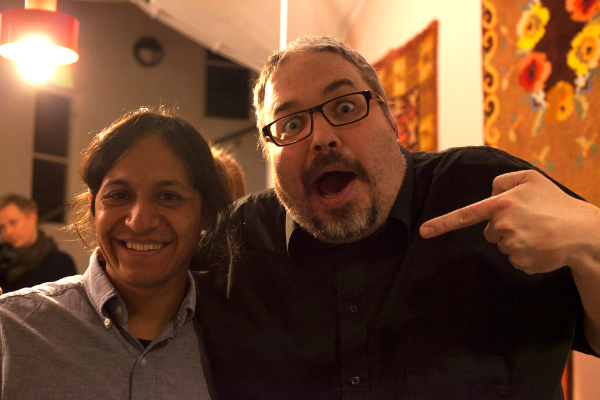 The librarian, his friend and colleague, is an advocate of openness and collaboration with memory institutions. The possibility of contributing to his work made Paul choose to join the event. #Hack4Fi was Paul’s first ever hackathon and he was not sure what to expect. After a bit of disorientation facilitator Sanna helped him join a project team and use his expertise on content retrieval in the Talking Heads project. Seeing memory institutions take part in hacking among others, and participating in cross-disciplinary work was a memorable experience. What made all this worthwhile, is that he hopes to bring back his experiences to his colleague in Ecuador. Looking forward to the next cultural hackathon. Hope to see you all there! Wikimedia Suomi, Wikimedia Sverige, Wikimedia Eesti, Wikimedia Norge and Wikimedia Danmark. Wiki Loves Maps is organized by Wikimedia Suomi ry together with the City of Helsinki. The event is part of the Wikimaps Nordic project, supported by the Nordic Culture Fund. Special thanks for the AvoinGLAM network, Forum Virium and the Ministry of Education and Culture for collaboration. This entry was posted in Uncategorized on 15 February 2015 by Susanna Ånäs. We are here. Where do we go next? Wikimaps participated in 3 different international events in November. This was the time to look back to where we have got to and what kind of opportunities the work has opened. Wikimaps has become part of an ecosystem of initiatives that aim to open and understand the geospatial cultural heritage captured in the documents held in libraries, archives and museums. We were especially happy to be invited to the event Moving Historical Geodata to the Web organized by New York Public Library. The event gathered together actors from the academia, open source and civil sectors from 3 continents to tackle the flow of historical geodata from printed maps to finally making use of it in cultural applications. The goal was to see where projects overlap, and think of common ways to deal with redundancy. Common ground was sought after with different exercises during two intensive workshop days. In the end of the days, the participants committed to some common goals. 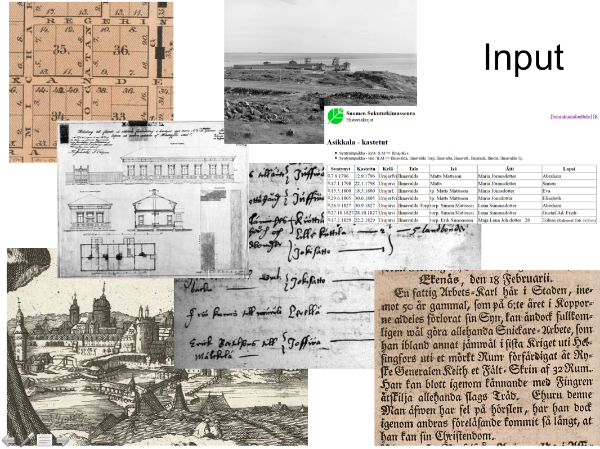 to contribute to the OpenHistoricalMap project as a project companion and establish a seamless workflow from old maps to OpenHistoricalMap. The communities are planning future working methods, and we hope to share some of the tasks together. 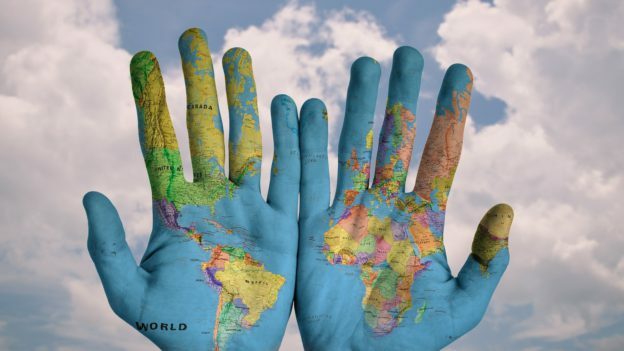 Another key element of the Wikimaps roadmap has been to be able to use Wikidata as a gazetteer, a database that can connect place names and geographies and their changes through history and across languages. Humphrey Southall, University of Portsmouth, nominated as Educational Institution of the Year in Wikimania this year, has done pioneering work with testing this in practice with the PastPlace gazetteer. The Pelagios project and others have been investigating the idea of the Spinal gazetteer, a gazetteer that is a reference gazetteer for individual gazetteers created in various research projects and initiatives. the way places and place names are modelled serve historical gazetteers: the alternative names of places can be limited to date ranges or to a specific context. the granularity of places accepted in Wikidata will serve at least gazetteers (towns, villages, hamlets, neighborhoods as well as rivers, islands, lakes etc.) if not even more detailed geographic entities. all geographic elements on maps would be notable enough to be accepted in Wikidata. there will be a good way to include or link to the historical geographic representation. While waiting for the collected input of the workshop, you can have a look at the slide deck of the participants’ presentations, the participant bios and Lex Berman’s notes for the event. We also shared our experiences about building the Wikimaps community, which appear on separate slides here. State of the Map, the yearly congregation of the OpenStreetMap world, was organized for the first time ever in Latin America. Wikimaps was presenting the idea of the Wikimaps Expedition. The project model will try to fuse practices from the successful GLAM projects into the participatory mapping projects as well as the meaningful humanitarian approaches. Initially thought to be arranged in the Archipelago Sea, in a bilingual area between Finland and Sweden, the expedition would take many forms. The project would engage GLAMs, experts, wikimedians, mappers and locals in a common effort to research the story of a location. The work would have a preliminary online phase, during which historical maps, photographs and geodata are uploaded to Wikimedia Commons with the help of volunteers and experts. Wikipedians would edit articles and create new ones on the area. Mappers would do historical mapping and upload historical geodata sets to OpenHistoricalMap. Locals and project participants would get together on location during the preliminary phase through field trips and other meetings, and finally an expedition would take place: collection events, interviews, editathons, mapping parties and workshops, staying together producing and documenting with all different project participants and partners on location for perhaps a week. The highlight of the event was the presentation by the schoolchildren of the Río Chico. Their education is entirely carried out over the web, as there is no local educational staff. They have mapped their little village and had travelled to the event to present the project. I missed it on location, but was able to catch up on video. The guidelines for notability and prohibition of conducting original research in Wikipedia have led to the situation that the enormous energy of people doing research on historical personalities and locations cannot be tapped into. I familiarized with the Japanese project Wikipedia TOWN, that has also set out to tackle these problems. 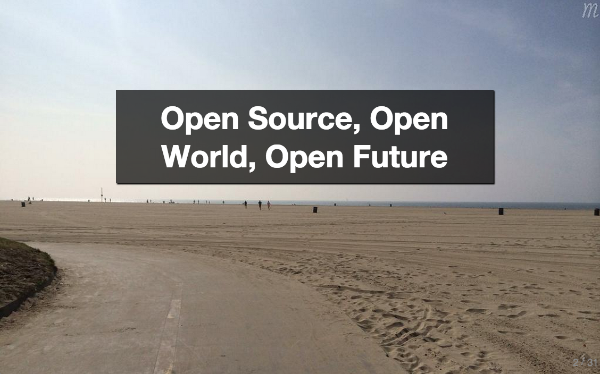 They contribute to 3 different repositories: OpenStreetMap, Wikipedia for notable topics, and LocalWiki for topics that don’t meet the criteria of Wikipedia. Finally, I had the opportunity to pull together thoughts from the previous conferences and present at the Iberoconf Latin American meeting of Wikimedia representatives. Thank you to the organizers of the events! This entry was posted in Documentation, Uncategorized, Wikimaps Tools on 27 November 2014 by Susanna Ånäs. A week of Digital Humanities in Lausanne with DH2014 was packed with projects sorting out and displaying cultural heritage. The emphasis is more on the ’sorting out’, as Digital Humanities is an academic discipline. It has a strong emphasis of textual analysis in English language, but there is more to it. Susanna Ånäs presented Wikimaps with a position paper and a presentation in the inaugural meeting of the GeoHumanities special interest group, a group gathering knowledge on the spatial research of cultural heritage. The first one of the initiators of the SIG, Kathy Weimer (Texas A&M University) opened the series of presentations about gazetteers with Geographic name authority records in the Map & GIS Library. Gazetteers are place name dictionaries, as described in Wikipedia. This meeting was another step to make the gazetteers of different research projects communicate with one another. The academics working with gazetteers have largely congregated around the Pelagios 3 project. Elton Barker (Open University), Leif Isaksen (University of Portsmouth) and Rainer Simon (Austrian Institute of Technology) are carrying out the principle: “Don’t unify the model – annotate”, allowing gazetteers to link to one another without completely remaking them. 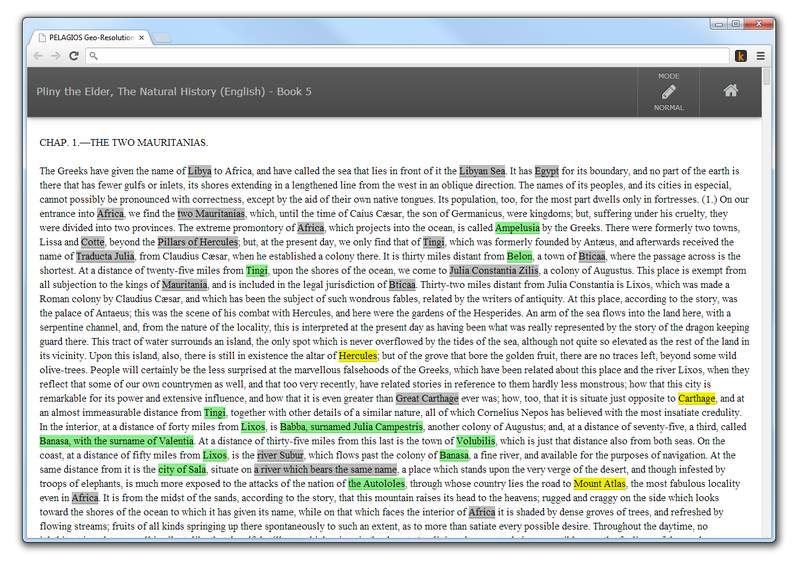 A new outcome is the Recogito text annotation tool to identify and link place names. Stuart Dunn (King’s College London) presented The Heritage Gazetteer of Cyprus. It gathers place names in Cyprus from different sources into a gazetteer. Modern place names are combined with historical units and archaeological entities. The project deals with layers of challenges: different transliterations and varying ideological perspectives. In the project one place name will not be preferred over another as a default name. Another strength of the project is a rich and thick description of places names of a limited location. Miranda Anderson and Beatrice Alex (University of Edinburg) showed the Palimpsest project that geo-locates extracts of literary works of Edinburg from the early modern period to the twentieth century. The Edinburgh Geoparser is used to georeference fine-grained place names in the texts: streets, buildings, local areas, and vernacular terms such as “Old Town.” The project tools and outcomes will be openly accessible, and imaginative events will engage participants interested in the local heritage. Petr Pridal (KlokanTech) described the Old Maps Online service. It is an aggregator of old maps, and it displays a collection of 150 000 old maps from archives around the world. The number will rise to 450 000 with a forthcoming update. Future directions include even stronger support for touch devices, transcription tools for place names and support for linked data formats, such as JSON-LD. Search engine optimization for old maps is a great idea: Typing ”old maps of Lausanne” the Google search will find the maps directly. New features for georeferencing maps are being added to the Georeferencer tool that accompanies Old Maps Online. Using OpenHistoricalMap for vectorizing old maps is also being considered. Humphrey Southall (University of Southampton) presented one of the Pelagios 3 network projects, the PastPlace. In GIS gazetteers have been seen simply as lists of geographical names and coordinates. In the past gazetteers were far richer: place encyclopedias, describing localities and their relationships with other geographical entities. PastPlace has set out to prove the use of Wikidata as a gazetteer. It includes places from Vision of Britain Through Time. Only those that have a Wikidata entry are included. The aim is to make entries for the missing ones. Karl Grossner (Stanford University) has worked extensively on Topotime together with his colleague Elijah Meeks (Stanford University). Contrary to representing time with ISO-8061 standard dates for start and end dates, the proposal sets out to express more uncertain dates like: “for 6 months before the war,” “around 1832,” or “during harvest seasons in her youth”. The project produces a specification for representing temporal entities typically found in historical texts, and some relationships between them. The authors have created graphical timeline layout programs to parse and render Topotime data and software tools to create Topotime data from excels and whatever the researchers happen to have. Eric Kansa (OpenContext), Adam Rabinowitz (University of Texas at Austin) and Ryan Shaw (University of North Carolina at Chapel Hill) introduced us to the Period-O project. The project creates a gazetteer of periods in history, art history, and archaeology. Instead of aiming at consensus about national and scholarly boundaries about the spatial and temporal coordinates of specific period concepts, the project proposes the construction of a Linked Data gazetteer of authoritative claims about the spatio-temporal coordinates of periods. Asanobu Kitamoto (National Institute of Informatics, Japan) and Yoko Nishimura (Toyo Bunko / JSPS Research Fellow) have worked on The Digital Silk Road project. It tries to make sense of incorrectly recorded geographical data by comparing several sources together. Locations are unfolded one by one, looking at local constraints, without trying to serve the overall co-existence of items on the map. Mappinning is an interactive tool that lets the user view the map with and without the transformation alternatively. Bethany Nowviskie‘s keynote Digital Humanities in the Anthropocene was presented by Melissa Terras, as Bethany was unable to be present. The dark-toned keynote painted a picture of the humankind at the brink of ecological destruction, and discussed time, preservation, degradation and loss. Bethany Nowviskie runs the Scholar’s Lab at the University of Virginia Library, that have produced tools for digital humanists. 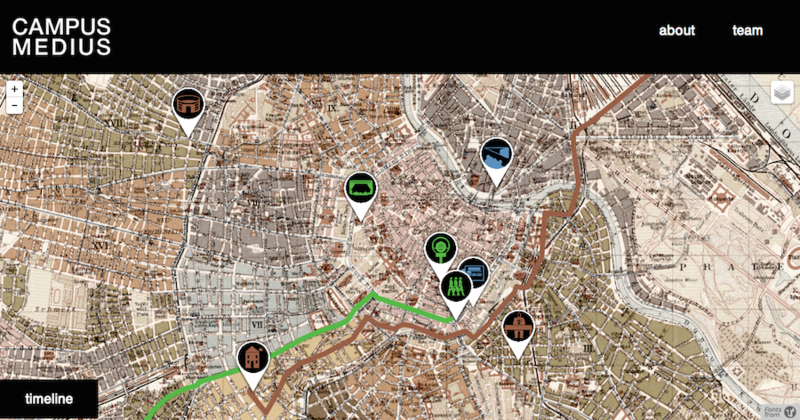 Neatline is a map storymaking tool for hand-crafted, interactive stories of a single document or a whole archival or cultural heritage collection. It builds on another open source tool, the Omeka, a web-publishing platform for both GLAM and hobbyist archival projects. The other keynotes were given by Bruno Latour (Sciences Po), Ray Siemens (University of Victoria) and Sukanta Chaudhuri (Jadavpur University). Simon Ganahl (Department for German Studies, University of Vienna), Rory Solomon (The New School for Design, New York) together with Mallory Brennan and Darius Daftary have produced the Campus Medius project. It is a study of Turks Deliverance Celebrations held by the Austrian National Socialists and the Home Guards during twenty-four hours in Vienna between May 13 and 14, 1933. The creators use the concept of chronotope, a bakhtian literary concept of space-time, defining “the intrinsic connectedness of temporal and spatial relationships”. The artistic research has resulted in an interactive map and an interactive documentary. The Topography – the interactive map – uses Urban Research Tool (URT) for geospatial mapping, developed at Parsons The New School for Design. The Topology – the interactive documentary – exists within Zeega, a tool for interactive storytelling developed at Harvard’s Sensory Ethnography Lab. The project will be published open-access in the online journal Sensate in 2014. 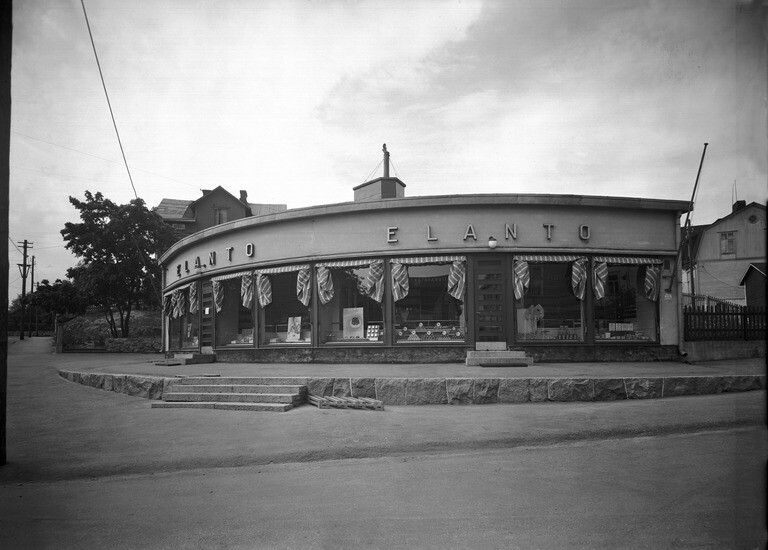 Lauren Tilton and Peter Leonard (Yale University) and Taylor Arnold are the creators of Photogrammar, a project showing and locating images of the the Farm Security Administration – Office of War project on both current and historic maps. The collection of over 170,000 monochrome and colour photographs were commissioned between 1935 and 1945 by the government of the United States of America. It also includes several of the most iconic images of the 20th century, such as the Migrant Mother of Dorothea Lange. 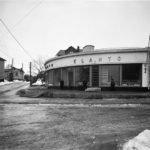 The photographic archive has been digitized by United States Library of Congress, and because the photographs were taken on behalf of the United States Government, access to and use of the collection is essentially free and open. Several methods were used to analyze and visualize the images. The geospatial study shows that the scope of sight was much broader than the American south. Text Mining reveals thematic similarity between the work of several different photographers. Statistical Analysis using contextual inference lets the researchers “rediscover” missing metadata, placing detached negatives in their original context. Jim McGrath and Alicia Peaker (Northeastern University) presented a poster about the Boston Bombing Digital Archive. It showcased the use of Omeka and Neatline. 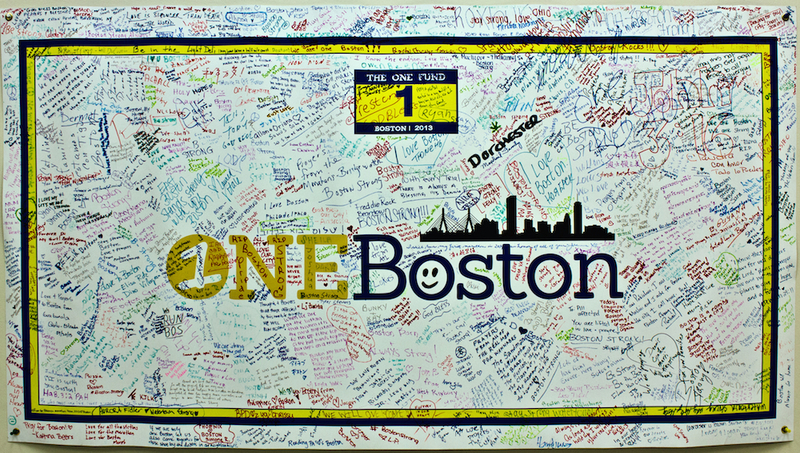 Stories, maps, photographs, social media logs and oral histories were collected in an endeavour that connected many different actors: universities, libraries and media companies in Boston in the aftermath of the bombing. The work was inspired by similar projects, such as The September 11 Digital Archive and The Hurricane Digital Memory Bank. Susan Schreibman: Revisionism as Outreach: The Letters of 1916 Project. Crowdsourcing the transcription of letters from the Easter uprising in Ireland, an event that lead to the independence of Ireland from the UK in 1922. Marilyn Deegan: Digital Cultural Heritage and the Healing of a Nation: Digital Sudan. Saving Sudanese cultural heritage. Mia Ridge, Brian Croxall, Amy Papaelias and Scott Kleinman: Play as Process and Product: On Making Serendip-o-matic. Serendip-o-matic is a “serendipity engine” that retrieves materials from archives around the world, based on your research library, for example. The playful Serendip-o-matic was built in less than five days as part of One Week | One Tool. Daniel Edward John Pett, Chiara Bonacchi and Andy Bevan: Mixing contributions, collaborations and co-creation: participatory archaeology through crowd-sourcing. MicroPasts is a British Museum project combining contributory, collaborative, co-creative and open source methods in research. Gary Priestnall, Katharina Lorenz, Mike Heffernan, Joe Bailey, Craig Goodere and Robyn Sullivan: Reconstruction and Display of a Nineteenth Century Landscape Model. The story of a physical exhibition object, a landscape model. How it was found, and how it was reconstructed. Caleb Derven, Aja Teehan and John Keating: Mapping and Unmapping Joyce: Geoparsing Wandering Rocks. The copyright expired on James Joyce’s works in 2012. These are the results of geoparsing and geocoding the places in one chapter of the Ulysses, The Wandering Rocks. Marie Saldana: An Integrated Approach to the Procedural Modeling of Ancient Cities and Buildings. Procedural modeling is a way to produce architectural environments from semantic rule sets. She was the recipient of the Fortier prize for a young scholar. Tomás Ó Murchú and Séamus Lawless: The Problem of Time and Space: The Difficulties in Visualising Spatiotemporal Change in Historical Data deals with the challenged historians encounter when trying the geographically visualize their datasets. Ian Gregory, Chris Donaldson, Patricia Murrieta-Flores, C.J Rupp, Alistair Baron, Andrew Hardie and Paul Rayson: Digital approaches to understanding the geographies in literary and historical texts. Discusses three general ways that geographical technologies can enrich our understanding of texts. Claire-Charlotte Butez and Francesco Beretta: SyMoGIH project and Geo-Larhra: A method and a collaborative platform for a digital historical atlas. Presenting a data model and a collaborative platform to produce a historical geographic information system, the Geo-Larhra, which is suitable for producing a new digital historical atlas. This entry was posted in Uncategorized on 17 July 2014 by Susanna Ånäs.